Ugggggh, I am so full. This morning I saw this veggie skillet lasagna in my reader from Macaroni & Cheesecake and decided to make it for dinner. I made some tweaks and the whole time it was cooking I was thinking, “This is going to be terrible. I should never stray from the recipe”. But I was wrong, it is not terrible. It is actually really good. This week I’ve been “attending” Online BlogCon. There is SO much information to keep up with. I’ve been trying to sneak in some reading while I’m at work but work has been getting in the way. Today, there was an awesome post about photography. I read it, took it to heart, then ignored all the tips with these pictures. Sorry Dorothy & Ashton! I’ll make you proud some day. Tonight, I was hungry and it was already dark. The original recipe called for mushrooms, which we don’t like, so I substituted a yellow squash. I also added ground turkey, which I had never cooked with before but really liked. 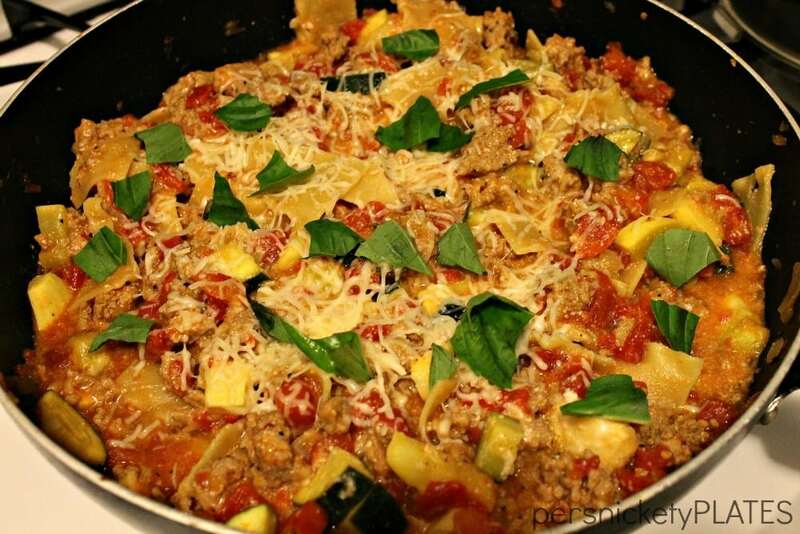 It also called for 6-8 lasagna noodles but I only used 5 since I used so much zucchini/squash. It comes together really quickly and is great for those nights you don’t feel like spending a ton of time in the kitchen. Serves: A lot. At least 4, probably 6. In a large skillet, add olive oil and heat over medium heat. Add onions cook, stirring frequently, until onions are translucent. Stir in minced garlic and cook for 30 seconds or so until fragrant. Remove from heat. Drain the tomatoes, reserving the liquid into a liquid measuring cup. Add water until it reaches the two cup mark. Add the tomato water to the onions mixture in the skillet. Add in 1 tsp. salt and stir to combine. Layer the broken lasagna noodles over top. Top with the drained tomatoes and spread evenly. Cover and cook over medium heat for 10 minutes, stirring every so often so the noodles don’t stick, always ensuring the noodles stay submerged int the tomato mixture. While that is cooking, in another pan, brown your ground turkey. Back to the noodles/tomato mixtures – after 10 minutes, uncover and stir in chopped zucchini and squash. Cook for 8 minutes more until noodles and squash are tender and cooked through. Taste and season with more salt & pepper if necessary. Add cooked turkey into mixture and let cook for a few more minutes, if needed, to get the veggies and noodles tender. Remove from heat and stir in 1/4 cup ricotta and 1/2 cup mozzarella. Stir together until melted and sauce becomes creamy. Top with additional cheese, if desired. If cheese needs help melting, just place it back over medium low heat for a couple minutes, watching closely, until cheese has melted. Top with shredded basil and serve. that looks positively delicious! I love a quick meal because that’s all I really have time for these days! 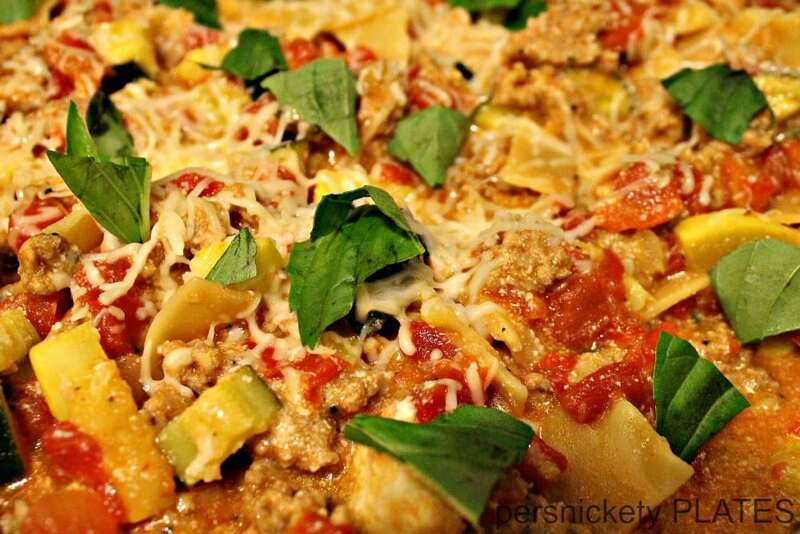 I love lasagna but never tried it in a skillet, this sounds delicious! I’m so glad you enjoyed it!! And I love that you added in the turkey!